The monthly ArtSmart Roundtable brings together some of the best art-focused travel blogs to post on a common theme. This month we are discussing Travel Art! You can find links below for the rest of the group’s posts this month. I take a lots of photos when I travel but I really admire those who can sketch cities, landscapes and people when they travel. An incredibly talented artist (although I am biased), John Singer Sargent is the epitome of the artist-traveler in that he captured his destinations in rich and brilliant but ephemeral scenes. I’ve been reading a lot this summer about the Gilded Age with its fantastic palaces, fashion and carefully orchestrated social life. Whether to shop or escape the stress (and occasionally scandal) of New York City, the elite of the Gilded Age departed for months of travel through Europe and the Middle East. The greatest artist of this era, John Singer Sargent also adopted a somewhat nomadic lifestyle traveling extensively. Famous for his portraits done in oil, Sargent created quick watercolor paintings while traveling – mostly as an amusement for himself. Masterfully executed, well composed and evocative, it is John Singer Sargent’s watercolor paintings that transport me to an age of luxurious travel, European charm and exotic destinations. Born in Florence, Italy to American parents, John Singer Sargent grew up on two continents. He continued to travel throughout his adult life temporarily living in or at least visiting England, Italy, Tangiers, Syria, Palestine, Spain, Portugal, Greece, the Alps, Norway and the US (including Niagara Falls, Maine and Florida). 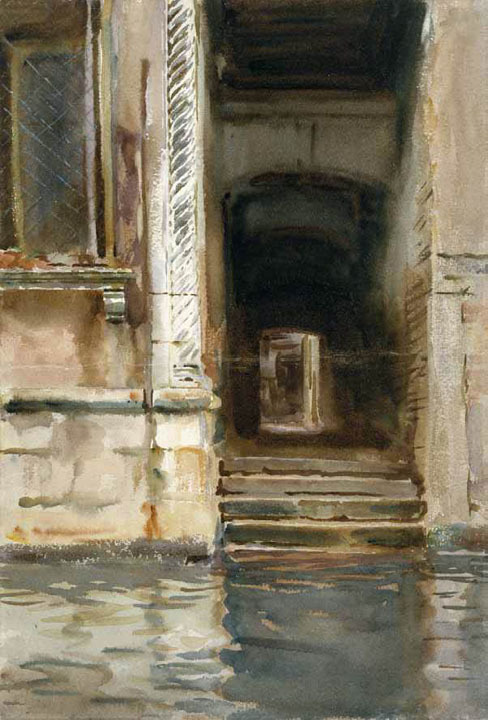 Sargent’s watercolors were born from his natural talent for observation and seeing as much beauty in alleys and in city commotion as there was in gardens and palaces. In his travels, he produced a number of preliminary oil paintings and studies which supported future pieces, but the watercolors were always something personal for Sargent. He gave them to friends and family but otherwise held on to them. Late in life, recognizing the value of these images, he sold many of them in two large lots to The Brooklyn Museum and The Museum of Fine Arts, Boston. These institutions put together an exhibit, John Singer Sargent’s Watercolors, which opens in Boston on October 13th after having spent the summer in New York City. In the event that you can’t see this exhibit in person, let’s take a tour through Europe and the Middle East via the incredible watercolor images of John Singer Sargent! Sargent painted many scenes of Venice. Already a romantic and uniquely beautiful city, the airy watercolors seem like charmed memories of transient moments observed from a moving gondola. In some of the images, you can even see that Sargent was painting from a gondola! It was a city he loved and returned to many times leaving us an impressive catalog of its canals, architecture and people. As I mentioned, Sargent loved to travel and clearly loved to paint. Here are images from his other trips. That’s quite a lot of traveling! What destination do you think makes for the most beautiful watercolor paintings? Where should Sargent have gone and painted? WOW!! I am in complete awe of Sargent. Although I have never heard of him before now, and thank you for this amazing introduction, I am a HUGE fan! His work is striking!! Love his rich tones, his subtleties yet stunning details especially with the Piazza Navona. I am completely blown away! Thank you so much for sharing this fascinating artist with all of us! Thanks so much Jeff! I love Sargent’s work and think he is such a skilled and versatile artist. Flipping through these images make me daydream my next trip! I’m happy to provide the introduction! While I didn’t put them in this post, I did find some watercolors of Norway! Apparently Sargent went fishing while he was there because they are all stream scenes and still-life trout he’d caught. 🙂 I was disappointed there weren’t any sweeping fjord images because that would be even more spectacular in watercolor! Exquisite post, Christina! Sargent’s travel ‘snaps’ are as gorgeous as his portraits. Too, too wonderful. Thanks and I totally agree. I love that his “for fun” paintings were just as interesting and beautiful as his more famous work. Did Sargent ever paint Paris? I looked through thousands of paintings for this post and never found any of Paris. Since wealthy Americans came to Paris for society functions, I don’t this city was ever considered a “vacation” spot and so I don’t think Sargent ever painted it. It’s quite a shame; I would have loved to see Sargent’s watercolors of the boulevards and gardens of Paris! Of course, I’m partial to the Tarragona one. I wish I could bust out a watercolor-for-fun like these. I’m so glad you chose this topic. What beautiful images. My mom is especially fond of Sargent’s work, so I will show this to her. Love the graveyard one! I am not familiar with Sargent’s work but am already drawn to him. It’s amazing how many artists were attracted to Venice from Sargent to J.M.W Turner but who couldn’t be, it is such an aesthetically pleasing city. I know, Venice is an artist’s (and writer’s and traveler’s) dream. Glad you like the graveyard image, I do too. It almost looks like a photograph.